(first published May 28, 2008, edited 1/13/18). I am re-releasing these blog posts to communicate how I traveled the journey to artist...mistakes I made, things I tried, money I wasted, hours spent researching. I plan to boil all this down into a simple formula for you to Restore Your Soul | Jumpstart Your Creativity. Les (Leslie B. DeMille) did his demo as we worked on our paintings. Of course, remember that each artist is seeing a different view/position of the model. I remember the first time this dawned on me. There were 15 artists set up in a semi-circle around the model. Taking a break, I walked around the room…it was like looking at a flip book...each easel had a slightly different view of the model! It was a lesson in itself to watch Les realize that from his first 5 minutes, he had nailed her features. He was so involved in his demo that he could have kept going with no notice of time. 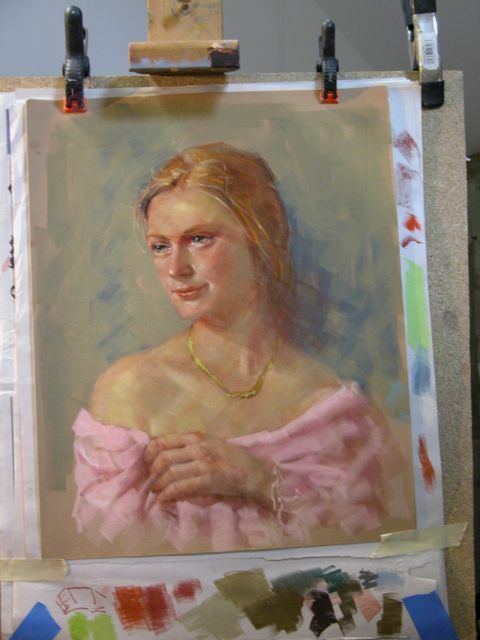 Lesson: no matter how skilled an artist may become, or how many portraits completed, there is still room for the perfect model, perfect light, and the muse appears to bring everything together. The first two painting are his, the third one is my attempt. The next 2 photos are of his first 5 minute progress, then his finished portrait. The last photo is my finished portrait. I ran out of time to finesse her hand. 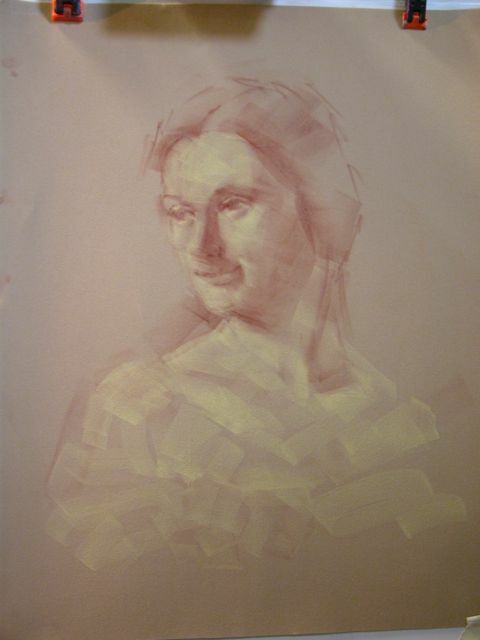 Also, the model and her expression always change as you are painting. There is a 10 minute break every 25 minutes...SO, any resemblance to the first photo of a pose is strictly accidental! And that's my story and I'm stickin' to it! Note to me: must figure out how to control the position of the photos...some day when I have time!